But the Barracks did not solve the problem of accommodation of either regular troops or militia, and billeting went on as before. A list remains among the Borough Records of the Quarters of Captain Alexander's troop in 1809. The White Hart, 19 men, 21 horses. The Bell, 7 men, 7 horses. The Crown, 12 men 14 horses. The White Horse, 5 men, 6 horses. The Castle, 4 men, 5 horses. The Pidgeon, 5 men, 5 horses. The Bull's Head, 4 horses. The Bowling Green, 5 men, 4 horses. The George & Dragon, 4 men, 5 horses. The Dolphin, 5 men, 5 horses. The Red Lion, Stoke, 5 men, 6 horses. There are also notes of two cases of local inhabitants refusing to submit to army demands. 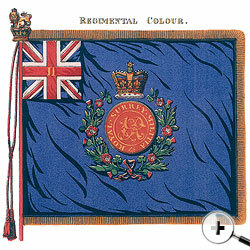 On May 22nd, 1810, 'George Holme Sumner, Esq., Lt Col Commandant of H.M.' s Second Regiment of Surrey Local Militia, came before us John French, gent, Mayor and George Waugh, gent, two of H.M.'s Justices of the Peace, and informed us that Joseph Green of the parish of Holy Trinity, Victualler, did refuse to victual a private soldier of the Second Regiment then quartered by him by a proper billet. Fined 40s' In 1811 "John Allen, farmer, refused to suffer his wagon and horses to remove arms, clothes and accoutrements of part of H.M.'s 4th Regiment of Foot from Guildford to Liphook Fined 40s". A small parcel of copies of letters to the War Office (surviving in the Guildford Muniment Room) shows that the erection of the Barracks had not removed the grievances of innkeepers, and Mayors continued to write frequently to the Secretary of War, especially before Fair Days and Quarter Sessions or when specially large numbers of troops were expected to be on the march, asking for them to be diverted. In 1796 the Publicans asked the Mayor to represent "the great Burthen they labor under by having 2 Troops of the Prince of Wales's Regiment of Light Dragoons at settled quarters on them, the Barracks not being large enough to contain the whole regiment, and in having soldiers very frequently quartered on them on the march. That there are no soldiers in settled quarters in the Town of Godalming (about 4 miles from this place) and that they are informed a great number of soldiers were lately landed at Portsmouth from the West Indies which they expect will march through this place". In 1799 the Mayor wrote that the inns would be filled for three days for the General Quarter Sessions for the County. In 1807 a fortnight before the May fair, "two troops of the German Legion are quartered in the Town, the Barracks not being large enough. The Innkeepers are also informed that the Artillery which took the Government stores from this place to Portsmouth are to return in a few days. They hope they will stop at some other place as their stables are already filled with the Troop horses and the English soldiers will not sleep with the Germans. There are several public houses within about a mile of the Town which have no soldiers quartered on them, viz., at Stoke-next-Guildford, Shalford and Artington. If the quarters of the two troops of Germans were extended to those places it would be a great accommodation to the Innkeepers'. An undated note from the Mayor reads, 'I am under the absolute necessity of renewing my application to you for the quarters of the 15th Regiment of Light Dragoons to be extended to the places adjacent to this Town, viz., the Bowling Green, Stoke-next-Guildford, Shalford and Catherine Hill. There are at present 34 Dragoon horses at the White Hart which renders the landlord unable to accommodate travelers upon the road". 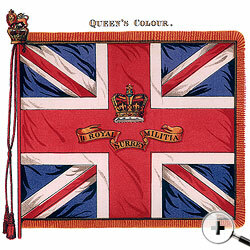 The Colours presented by Viscountess Cranley on 19th May 1854 on the training ground of the Militia, Woodbridge Road, Guildford. In 1807, hearing that a great number of troops were to be quartered from Saturday to Tuesday, Mr John Nealds pointed out that the annual November fair was beginning between 3 and 4am on the Monday and that large numbers of people would arrive on Sunday evening. Similar objections were raised before the fair at Catherine Hill in 1809, 1810 and 1811; two answers from the Secretary at War state that the necessary steps had been taken and that no troops would be quartered during the fair. When we remember that the population of Guildford at this time was round about 3,000, we can well imagine that the influx of 1,000 or more soldiers must have caused great problems. From early times a road ran east of the Friary estate making an outlet from the town to Windsor. It appears on the Ichnography of 1739 and is now known as Woodbridge Road. In 1812 the Corporation sent the following petition to the Commissioners of the Barrack Department, 'Petition, That the road running parallel from North to South of the Barracks which is the high road from Guildford to Windsor and Blackwater and which forms one of the principal ingresses …….. And is in consequence of the Barracks particularly used by wagons conveying forage and manure to and from the same is rendered particularly inconvenient to the public from its narrowness not admitting more than one wagon to pass at a time ..... and that there is a space of (the number is not filled in on the copy) feet of waste ground lying to the back of the barracks adjoining the road which is not appropriated to any use .... etc. "The Corporation asked to be allowed to purchase the strip of land for the use of road widening. 'The space asked for is walled in by an old wall in a very ruinous state built some centuries ago with flint and rubbish, materials of no value for such a purpose again .... We therefore hope that the Commissioners will be pleased to accept a Palisadoed Fence of cleft rail such as is usually made the Fence of Barracks." Thus disappeared the eastern wall of the old Friary garden.